SELF BUILD CONSTRUCTION METHODS – WHICH ONE IS FOR ME? When setting out a design brief with an architect, the construction method you select for your Self Build will have a strong influence on many other aspects of the project. It can affect the speed of the build, the overall costs, as well as the energy efficiency. There are many construction methods to choose from, and picking the right one for you will depend on your finances, planning permission, and design criteria. 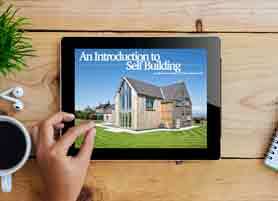 The following guide is designed to help potential Self Builders gain a basic understanding of which construction method suits their needs most. One of the most popular construction methods in the UK, Brick and Block consists of a traditional-looking outer layer of brick, with an inner structure of concrete block. The cavity between the two layers is then filled with your preferred insulation – making the Brick and Block method a safe way of ensuring Self Build homes have very strong walls with sufficient thermal and excellent sound-proofing qualities. The airtightness of Brick and Block has been questioned in recent times, with Timber Frame and Structural Insulated Panels methods proving stronger performers. With the Government backing a significant increase in the airtightness of homes, special tapes and membranes have been developed to ensure Brick and Block’s popularity is supported by its efficiency as an airtight construction method. Many Self Builders buy their bricks in installments as and when they are needed, which is particularly useful when dealing with a Self Build mortgage issued in stages. These lower initial costs contribute to Brick and Block’s continual popularity. 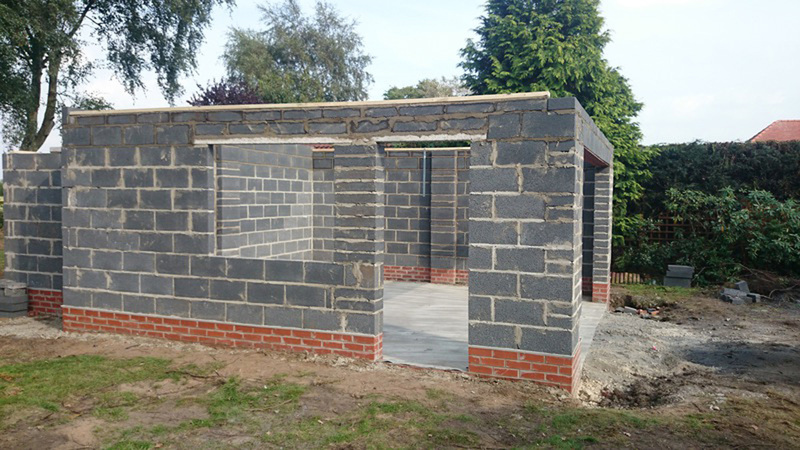 Built completely on site, the Brick and Block construction method is a much slower build process than the likes of a Timber Frame or a Structural Insulated Panel route, however, there is less of a delay in acquiring the materials and having them on site. 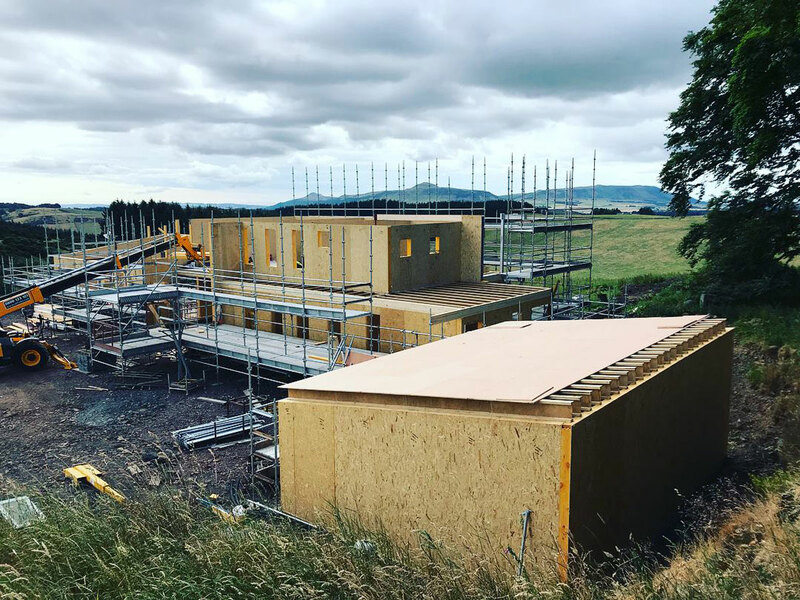 Prefabricated off-site in your choice of style, the Timber Frame construction method has a quicker on-site build time than the Brick and Block process. The Timber Frame acts as a superstructure, which supports your Self Build home entirely. Removing the need for any internal load-bearing walls, the Timber Frame is ideal for Self Builders keen to fulfill any open plan designs. In the UK, many of the timber-framed homes are built using either Open or Closed Panel Systems. ‘Open Panels’ consist of a softwood stud frame which is backed with a layer of sheeted timber. The panels are manufactured following the house design specifications, before being delivered to the site and fixed together to form the structure of the house. ‘Closed Panels’ are similar, but are taken a step further in the factory prefabrication process. Insulation and vapour barriers are added, with plasterboard fixed to the frame in order to ‘close’ the panel. 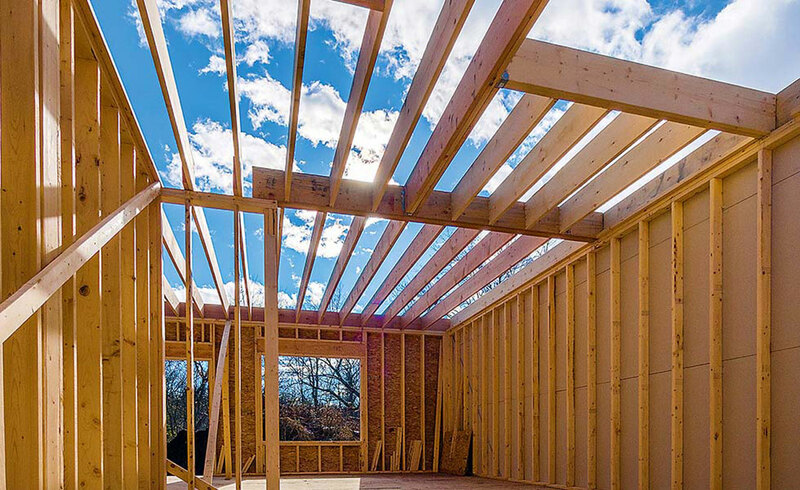 Timber Frame homes are star performers when it comes to high thermal insulation, airtightness, and soundproofing. In addition to this, the lightweight frame means foundation specification can be reduced. The insulation options differ depending on the infill method you choose for your Self Build home. Building your walls from straw bales or from Structural Insulated Panels (SIPs) can enhance both the strength of your Self Build, as well as its insulating properties. More contemporary designs involving large glass areas are supported well by the Timber Frame construction method, whilst leaving the timber beams exposed in the ceilings and walls can add an element of traditional character to your Self Build project. One of the most cost-effective and energy-efficient construction methods for Self Builders is the Structural Insulated Panels system. As SIPs Industries explain, these panels are made as a composite through layering a rigid insulating material between outer boards. 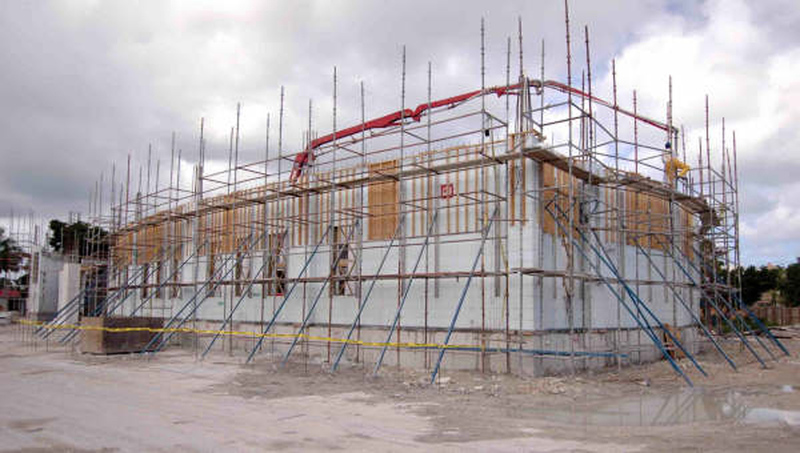 The most common materials in SIPs manufacturing are Oriented Strand Board (OSB) with a core of Expanded Polystyrene (EPS), although a range of other materials can also be used. Whether opting for a traditional oak frame with SIPs as your infill choice, or if you decide to use SIPs as your construction method from the beginning, the benefits of selecting Structural Insulated Panels include a sturdy, airtight structure for your home, with excellent levels of insulation already built in. These highly insulated wall and roof panels are now typically 217mm thick, offering a U-Value of 0.13. The SIPs method has a significantly higher upfront cost, but due to such energy-saving properties, your Self Build home can benefit from greatly reduced energy bills in the future. In a similar fashion to a Timber Frame, SIPs are prefabricated off site in a factory. 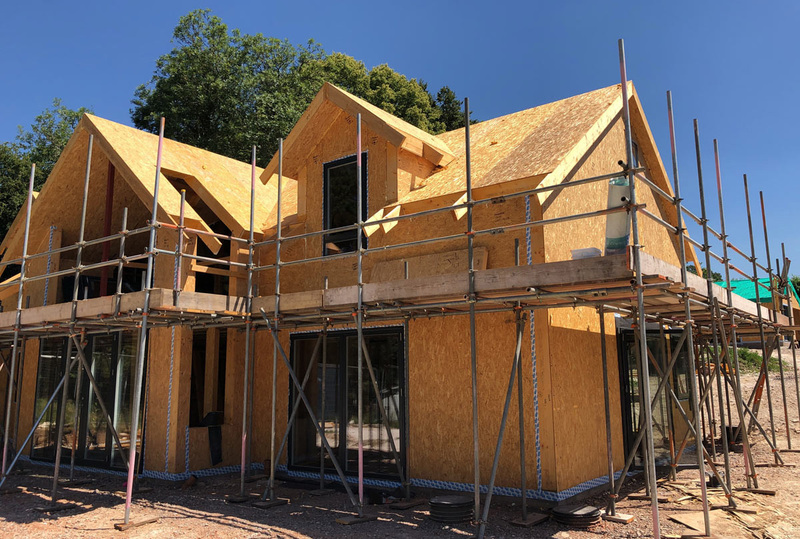 Although lead times may be significantly longer than traditional methods such as Brick and Block, the SIPs construction method makes up for this through its speedy 10 to 12 days on-site assembly – reducing labour costs considerably. SIPs offer benefits to the design of your Self Build home, as roofs can span 4.8m without any additional support – meaning large, open spaces can be achieved. As well as this, there is no need for any roof trusses – allowing vaulted ceiling features to be added into designs at no extra cost. As a widely popular method of construction, Building Control and Mortgage companies acknowledge the Structural Insulated Panels system. For more information on SIPs construction, click here. An alternative construction method to using timber or brick is Insulated Concrete Formwork (ICF). First used in Germany during the 1970s, ICF has been a successful construction method all over the world, in a variety of climates. This is a highly versatile method, and also provides exceptional built-in insulation to the structure of your Self Build. ICF consists of hollow polystyrene blocks, interlocking together to create a mould into which ready-mixed concrete is poured. This ultra fast build method allows more adventurous designs to be achieved, whilst tackling the insulation at the same time. Curved structures can be easily formed using ICF, and suppliers tend to offer some training to the Self Builder, so that they can get very hands-on and help with the building work. Despite costing around 5% more than the traditional Brick and Block method, Insulated Concrete Formwork constructions can erected in a matter of days, so labour costs are considerably less – and with the insulation incorporated into the structure, ICF can save a great amount of onsite build time. However, the concrete mix and pour is the crucial stage of this construction method, and finding experienced ICF builders locally is not the easiest process. With superior airtightness levels to traditional construction methods, ICF is a great system when aspiring to meet Passivhaus standards. It provides excellent protection from fire, and is even able to withstand flood damage effectively. ICF walls require very little maintenance, and are unaffected by rot, vermin and termites. Recognised by the Council of Mortgage Lenders as a standard form of construction, ICF is also accepted by major warranty providers – such as NHBC. More information about ICF can be found on the ICFA web page, here. A slightly rarer – but intriguing – construction method is the Log Home. Timber logs have been a popular method of building homes in the likes of Canada, America and Scandinavia for many years – but here in the UK, our log buildings are usually smaller-scale holiday homes in the form of lodges or cabins. 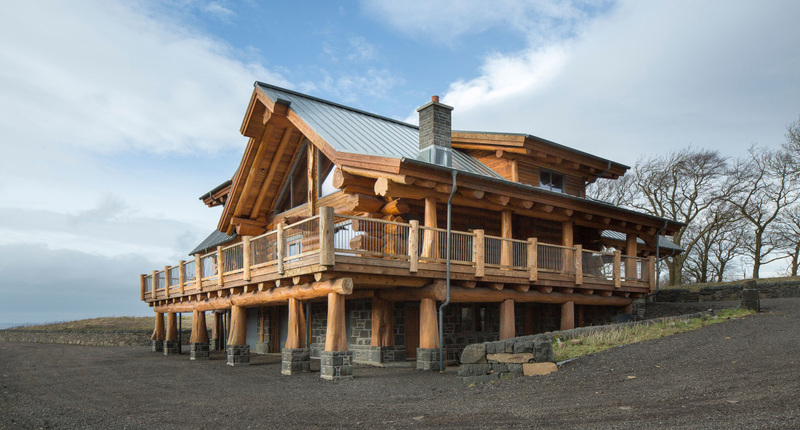 As a building style, log homes tend to be more expensive than using traditional construction methods, but, if designed and built properly, the result can be simply stunning. Depending on the system selected when building a log home, there can often be scope for hand-crafted aspects of the building. The unique elements brought to the project by your selected craftsmen can really add something special to your home’s design. Robin also points out that local planning authorities tend to look favourably on log homes, due to the use of very sustainable materials – and as long as you take time to educate Building Control about the special requirements of log homes, most departments are co-operative, and genuinely interested in log home projects. To read more about Log Homes and for more expert insight from Robin Gray, click here.